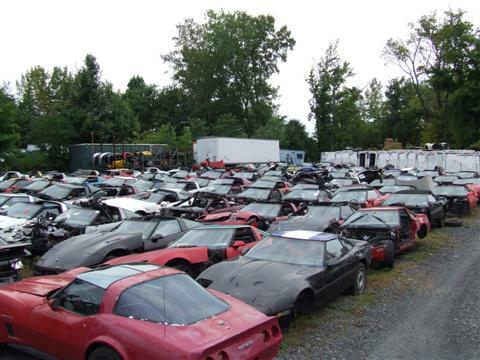 or should we say "Ron's World"
Located in Bristol, PA., just outside of Philadelphia, owner Ron DeSmedt opened his doors for business in 1990 with three Corvettes and a half-acre of what he calls "the Field of Broken Dreams". Now, after tremendous success, he has been forced to expand to four acres to house the nearly 450 Corvettes that occupy the grounds. All of these 'Vettes arrived within the last three months, as new cars come in all the time. "Most of the Corvettes I get are from salvage auctions and are only as good as their parts," Ron explained. "However, a few of them are restorable. Some of them we restore in our 10-stall shop and some we sell as is." In addition to the extensive yard, Ron also has several warehouses full of engines, transmissions, suspension parts and electrical oddities. Sure, most of the products he sells are previously owned, but he also sells many new parts still in original wrappings, such as chrome trim, emblems and taillight lenses. Some of the salvages items include instruments, glass, steering columns and wheels, seats, wiper motors, A-frames, speakers, door panels, gas tanks, bumpers, moldings, half-shafts, rims and tires, and just about anything else, including Dana rears and complete rolling frames. Whichever part you would find in a Corvette can be purchased at Contemporary Corvette. 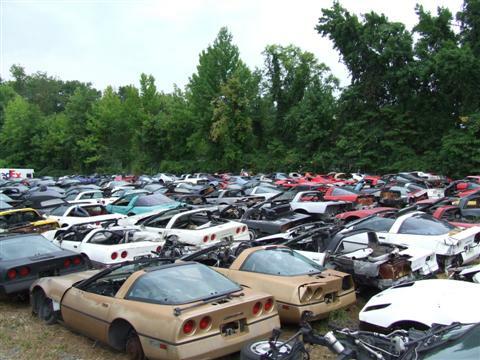 Even the most twisted Vettes still have plenty of salvageable parts. Ron has been a Corvette enthusiast all his life. His first one was a 1969 Convertible that he and his father Frank restored. Ron was so impressed with the way the car turned out, he decided to buy a few to repair and sell. 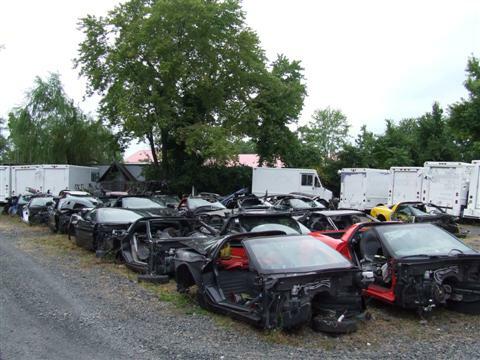 Some of the cars he bought were totaled, so he broke them up for parts and sold them off one piece at a time. It turned out to be a lucrative profession. He then bought some land and began buying totaled Corvettes and selling them in parts. From there his interest and collection escalated to the display you see here. Inside the shop, Contemporary Corvette carries new parts still in GM wrappings. Walking through "Ron's Field of Broken Dreams" was like traversing a graveyard. The rows of endless Corvettes of all shapes, sizes, and demises were perfectly arranged. It's easy to detect on many of them that front clips, rear quarter panels, glass, brakes, etc., have been removed and perhaps returned to life in another Corvette. Mixed in with the semi-salvagable cars are several Corvettes that caught fire, one way or another. "More than half of them were intentionally set," Ron tells us. "Many of them were for insurance scams, while others were set by vengeful spouses. A red '85 Coupe was set ablaze by the owner's disgruntled wife. Apparently they were going through a bitter divorce, one thing led to another and she set fire to his "Vette." Not every car in the yard was set on fire, but they all have a story behind them. We walked up to a totaled 1995 Coupe that had just came in a few weeks ago, the end result of a fatal high-speed accident. 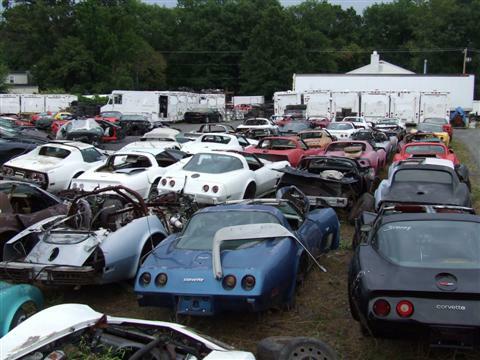 Even though most of these Corvettes may appear to be worthless, they actually have many useful parts which are still usable. As long as there are some good parts on the cars, Ron will usually take them because of the high demand in the marketplace. "Most of the parts we sell are by mail order," explains Ron. "We send parts all over the U.S. and to countries like Italy and Germany." Ron estimates that 75 percent of his business is from selling parts, but if you're looking for a car to restore yourself, or perhaps one that's already complete, he can still be of some assistance. In front of the shop are about a dozen or so cars that are ready to run, while just inside the gate for the do-it-yourselfers, Ron has a few Corvettes needing cosmetic surgery. Of course, he has all the parts right on the premises needed to rebuild it. Whether you're looking for some hard-to-find mechanical, electrical, exterior or interior trim parts, or perhaps even a complete Corvette to rebuild as a winter project, Contemporary Corvette has it. And if you've been thinking of dropping in a TPI system or the complete TPI engine assembly in an old midyear, then Contemporary Corvette is the source for everything needed to do the conversion. They are located at 2705 Old Rogers Road, Bristol, PA 19007 USA 800-367-8388.